Picking up, almost right off the bat, of the Doctor Who audio adventure, The Assassination Games is series one of Counter Measures featuring the tremendous trio from Remembrance of the Daleks. Like Jago and Litefoot, this series has four stories that are loosely linked by multiple themes. I will admit, I remember when this series was first announced and I was slightly dubious. But I guess if Vienna can exist as a Doctor Who spin off, then anything can happen. This series begins in early 1964 with the ICMG fighting for the funding that they deserve with the Dalek events around Coal Hill School not having proved their worth. 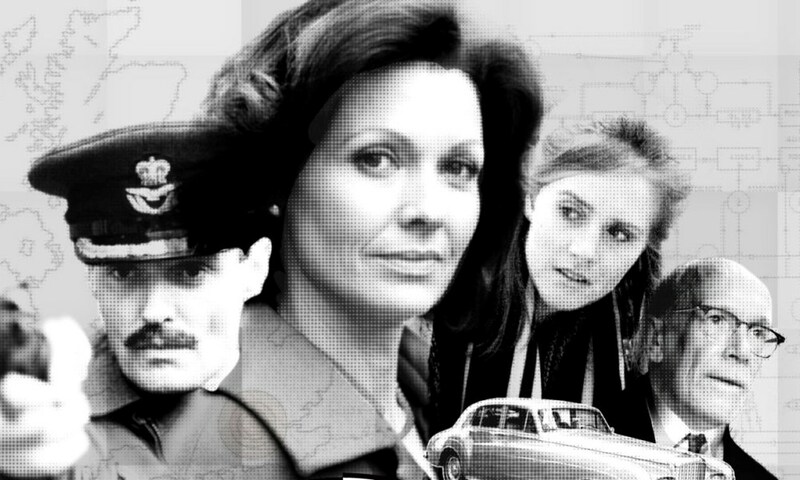 The personal are the same as they were in Remembrance: Simon Williams as Group Captain 'Chunky' Ian Gilmore, Pamela Salem as Rachel Jensen and Karen Gledhill as Alison Williams. And there is their supervisor, Toby Kinsella, played by Hugh Ross. Together they investigate the strange and the unexplained, like UNIT before there was UNIT. The set kicks off with Threshold by Paul Finch and it works as the first time since Remembrance in order to investigate strange phenomenon at a seemingly abandoned factory where research is being done into teleportation. Maybe this story won't win any points for originality but it turns out to be an engaging story of spooky supernatural investigation with a nice little science fiction twist. It also nicely sets up the operational parameters for Counter Measures which aren't what one might expect! Artificial Intelligence by Matt Fitton and The Pelage Project by Ian Potter are perhaps the typical stories of the set. Not having been born in the 1960s, I don't really know what life was like back then but there seemed to be some fear about social programming and that fear is what these two stories seem to tap into. The first story concerns a telepathic computer built by the UK so that they can control agents without detection and the second concerns a small factory community with a sinister aim. Both of these stories are unsettling in their own ways and everything manages to come together perfectly in terms of writing, acting and sound design. Stephen Greif is amazing as the baddie Paul Temple in The Pelage Project and credit must go to writer, Ian Potter who doesn't take the easy way out for his character making him hypocritical or manically insane. Instead Temple is simply an intelligent man who has a particularly jaded outlook on life and has identified a problem with the modern world and a harmful way of sorting it out, which is always more scary. It is Justin Richards' task to bring the set to a close with State of Emergency. I like stories about coups and there is a feeling of what if this happened to you and what if you couldn't stop them? State of Emergency captures things perfectly. As the events of the story spiralled out of control, I couldn't help but be caught up in proceedings. Good coups stories create a sense of fear and paranoia and have a slippery moral slope and that was something else this tale captured. I'm far too young to have any idea what Harold Wilson was like as Prime Minister but Duncan Wisbey turns in a good performance as him mixing a resolute attitude with intelligence, practicality and pragmatism. This episode features some real punch-the-air moments where I loved the actions of our heroes. The was undoubtable the best of the bunch. What few weak moments there are, are carried well by the strong cast. Simon Williams is brilliant as Gilmore but he could have come across a cheap-Brigadier knockoff. Thanks to Williams and the writers he doesn't, he is no-nonsense to be sure but a decent fellow and a little less of a stick-in-the-mud than the Brigadier could have been. Tell him what needs doing and he will do it. But there is also a sense underneath that he is a wounded man but this is wisely underplayed and just works as a little touch to his background. Pamela Salem is brilliant as Rachel Jensen who occupies an unexpected role on the team. Both intelligent and passionate, she is very strongly principled but the scripts rightly keep her away from having to spout technobabble and she keeps a strong head in a crisis. As with Gilmore, she gets a background that is touched on but not dwelled on and she is obviously not a very happy woman. But she doesn't let that bother her much. Out of the gang it is probably Karen Gledhill's Alison Williams who is the weakest link here but it isn't the actress' fault. She is a capable scientist in her own right but all she does is help Rachel or flirt with men for the sake of their different missions. She displays compassion when it is needed and has a boyfriend. I really liked her, she is sparky but given her age and the level of intelligence she obviously has, more could have been done with her. Hugh Ross proves to be a real revelation as Toby Kinsella. I don't know much about his previous work but he is nothing short of amazing here. He is a smooth charmer, a bureaucrat - not a pompous or obstinate one - he is principled and very pragmatic. I particularly loved the silky way Ross delivered each of his lines. He was a sheer joy to listen to and we see some good material sown into his character that will hopefully get explored later. I've got two series' of Counter Measures to listen to and if each series can keep up the same level of quality as this one, then it might just become my favourite Doctor Who spin off yet. I love Jago and Litefoot and I love the characters but I have a few problems with the plots sometimes. With Counter Measures, I had no such problem, I loved the characters, I loved the plots and I loved the spooky stories that they are telling. You're own government turning on you, or visa versa, is a lot scarier than werewolves and vampires.